If you are going to plant maize, then it stands to reason that you intend to get the best yield possible off the plants growing in that field. This means you will have carefully considered all your seed, fertilisation and weed control requirements. One of the most important factors to consider is plant nutrition. It is important to use the right fertiliser to ensure the plant roots can take up all the nutrients available in the soil and convert this into grain. It is therefore necessary to take regular soil samples, so you know how much fertiliser to apply. There is still more to the science of fertilisation though, because it is equally important to apply the necessary nutrients at the right time, so the plant can use it as efficiently as possible. 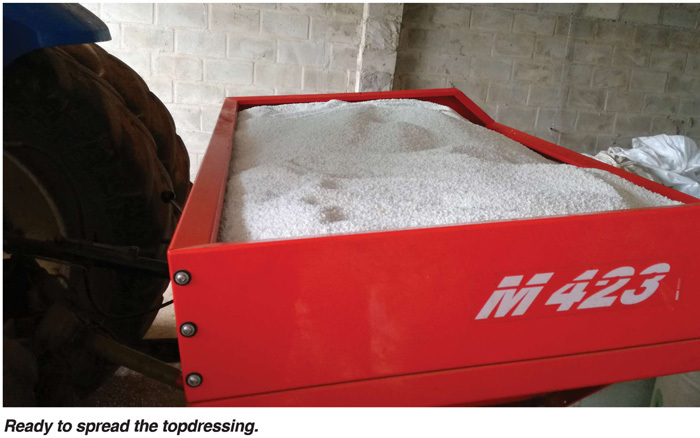 Top dressing refers to a process by which any material from either natural or synthetic origin is added to the soil to supply nutrients to a plant or crop. The most basic definition of top dressing says it is an application of manure or fertilizer to the surface layer of soil. Top dressing is thus a way to ensure the fertiliser that the farmer puts down is used optimally towards the benefit of the maize plant and ultimately the yield. What does it mean when we say the amount and type of fertiliser is used optimally? The effective use of fertiliser applied at the correct time means you are more likely to extract the maximum amount of grain possible. It is also most likely to result in improved water efficiency so that none of the water available to the plant is wasted. This means the plant will produce more grain per millimetre of water available – in other words secure ‘more crop per drop’! Ensure that the fertiliser does not come into direct contact with any part of the plant to avoid burning or scorching. The best method to top-dress is band placement as it is much more economical. The earlier you can do your topdressing the better e.g. once before it reaches knee height and then again when the plant is waist height and still in its pre-tasselling stage. It may be necessary to top-dress at least twice in areas where soils are less fertile. It is a good idea to split the dressing so that your fertiliser concentration is decreased and less likely to cause sub-soil acidification which will scorch the roots and harm the plant’s potential to uptake nutrients anyway. Topdressing should preferably be done when the soil is moist. 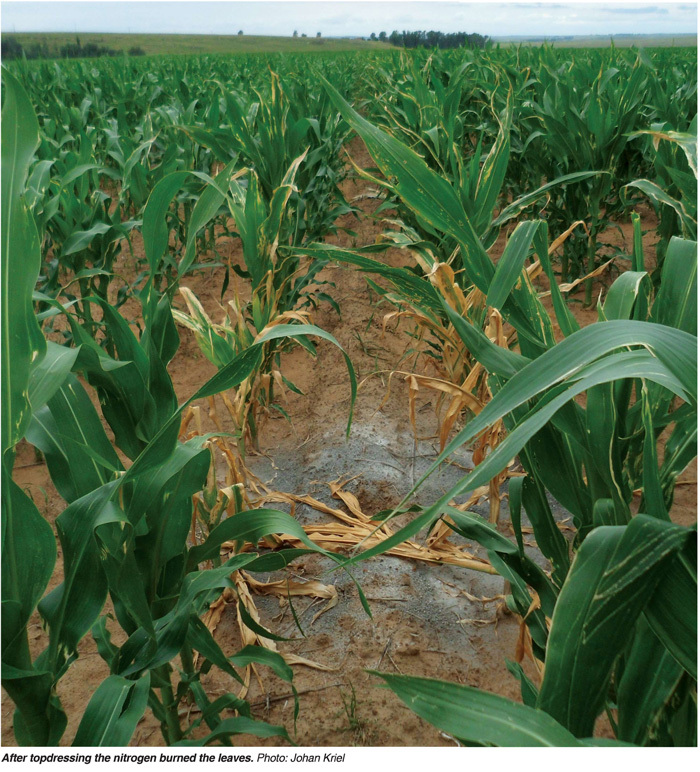 Avoid topdressing during heavy rains as the fertiliser will be leached from the soil or washed away. Weed control should be done prior to topdressing. This simply means the weeds will not get a chance to take up any of the nutrients intended for the crop. Weeding should always be done to avoid competition for both nutrients and sunlight. Do not be tempted to apply all the fertilisation prescribes in one application process. The negative effects are too serious to take this risk as not only scorching of the roots but also fertiliser will fall outside of the optimum band area and nutrients will be wasted. Remember the maize plant’s nutrient requirements increase steadily and the final yield potential is determined in the V12 stage. This is the stage when maize is rapidly growing, and a new leaf appears every two days as well as significant root development. It is important to do accurate calibration of the fertiliser spreader before you start your application. It is crucial to apply the prescribed amount of fertiliser in order to achieve optimum results. These factors are important to keep in mind when applying your topdressing fertiliser. But the most valuable factor is to be pro-active and to get it done! Often, we don’t apply at the correct time or we don’t apply the correct amounts which result in poorer yields. As mentioned before; in order to achieve the best possible yields, we need to consider all the growing factors of a plant. Don’t neglect the topdressing factor.